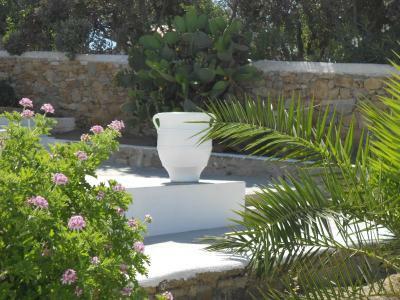 Lock in a great price for Casa Bianca – rated 9.4 by recent guests! Everything was perfect. The location, the room, the pastries at breakfast... Andreas, the owner, and his mother, were very helpful and nice. Also Dimitrius, the driver. We had a wonderful stay! This is an excellent place to stay. Out of the party scene of Mykonos Town and Paradise beach. But, those are easy to get to by short bus ride if you desire. Very nice pool. Helen and the rest of the staff were outstanding. Free pickup/drop at the airport. I highly recommend!! Clean and nice, very friendly staff, they have arranged for an early breakfast as I was checking out early. Bus stop just next to the hotel so you can east access the city. They provide free transportation from/to airport and port. Hotel owner Elani was such a happy & helpful host, as were her staff. Free transfer to and from port. Hotel was fantastic. We were in room 9, my husband & I, shower was superb, bed comfortable, air con great, pool as cold as I needed to feel refreshed, breakfast was on until 11am. Anything we asked for was answered. 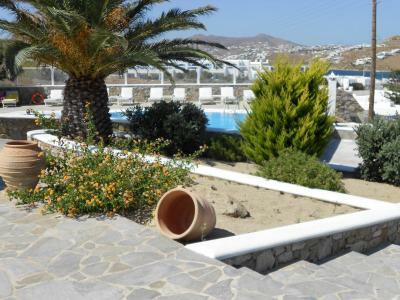 Close to bus stop into Mykonos town and 5 min walk to ornos beach. Everyone and Everything, like for instance: - Location in Ornos is perfect, quiet but on the same time close to the most important connections. - Pool very cool, and Room clean with a wonderful shower. - Breakfast is incredible, amazing homemade omelette and salad, great Greek yogurt, few choices of high quality. - Everyone is very helpful and kind. - Special appreciation for Special offers like the free shuttle from/to port/airport. It was a beautiful location and very well looked after. It is a family owned hotel so everything felt very personalised and special. I would definitely go back. Everything was perfect ! 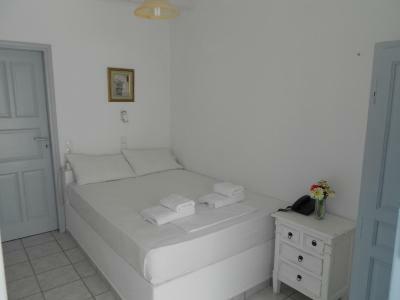 Recent, confortable and pretty rooms with a beautiful view on the sea A very good breakfast with good choice A very good place to visit the center of Mykonos (by bus) and beaches in the south (by a little boat). Very close to the beach of Ornos and its center. And a wonderful welcome and service by Eleni, her mother, her family and all the staff ! Only 1.2 mi from the town of Mykonos and a few feet from the beach, the traditionally built Casa Bianca offers Cycladic hospitality in the picturesque village of Ornos. Featuring white wooden ceilings and furnishings, the family-run complex consists of rooms and apartments equipped with air conditioning, TV and refrigerator. Apartments also feature kitchen facilities. Guests can relax at the hotel's swimming pool featuring hydromassage facilities or enjoy snacks and drinks at the on-site bar. Casa Bianca guests may also benefit from the free wireless internet connection, available in the public areas of the hotel. Laptops and netbooks can also be provided upon request. Near the hotel, guests will also find a bus stop connecting frequently to Mykonos Town. This property also has one of the top-rated locations in Ornos! Guests are happier about it compared to other properties in the area. This property is also rated for the best value in Ornos! Guests are getting more for their money when compared to other properties in this city. 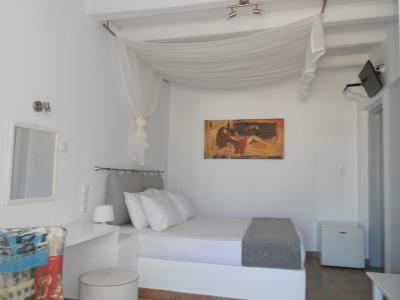 When would you like to stay at Casa Bianca? Air-conditioned room with cable TV, direct dial telephone and fridge. Two-room apartment with kitchenette with fridge. 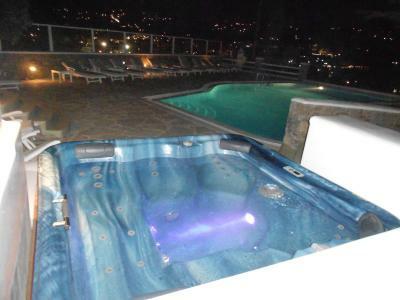 It is equipped with air conditioning, cable TV and direct dial telephone. 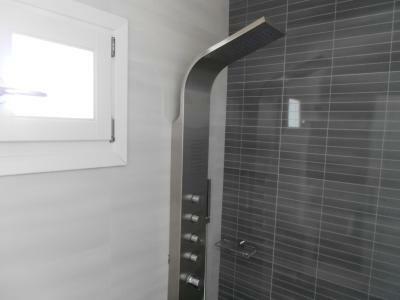 A hairdryer is included in the private bathroom. 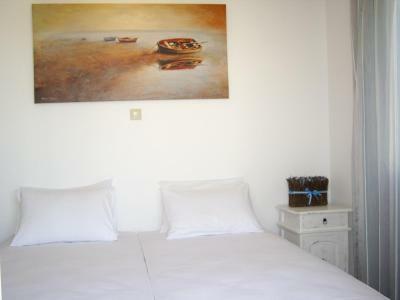 Double room with sea view. It is also equipped with air conditioning, cable TV, direct dial telephone and fridge. 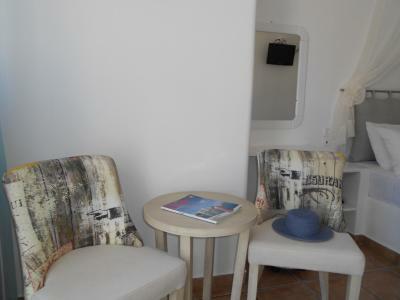 Three-room apartment with partial sea view and kitchenette with fridge. It is also equipped with air conditioning, cable TV and direct dial telephone. 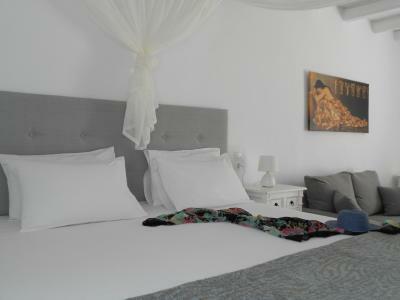 White washed walls, air conditioning and a flat-screen TV with satellite channels are featured in this room. Please note that no sea view is available in this room type. Air-conditioned room with a cable TV, direct dial telephone and fridge. This apartment features a satellite TV, air conditioning and patio. 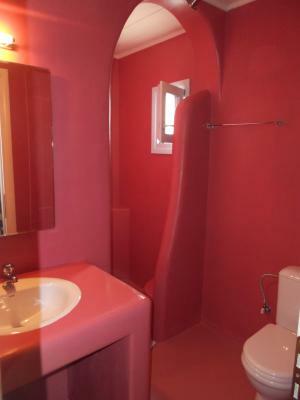 Includes one bathroom. This single room has a patio, cable TV and air conditioning. House Rules Casa Bianca takes special requests – add in the next step! Casa Bianca accepts these cards and reserves the right to temporarily hold an amount prior to arrival. We had a fantastic stay at Casa Bianca. 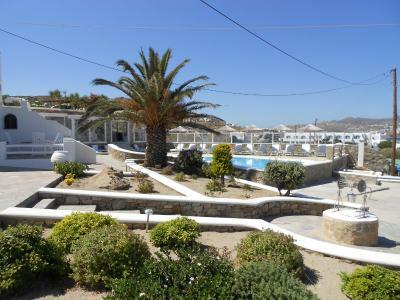 Lovely location away from the road but very close to the little centre and to the beach. Everyone working in this family-ran hotel was extremely kind and lovely, Eleni and Dimitri in particular. Highly recommended. Very clean, lovely rooms & facilities, fantastic service - overall excellent hotel! The room was cleaned everyday with clean sheets and towels. The staff was kind, warm and friendly and made us feel comfortable. 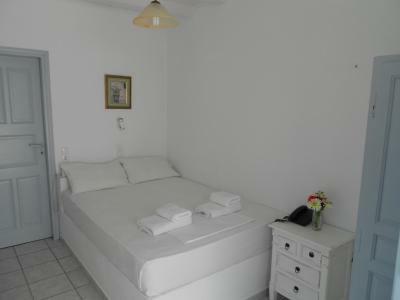 Good location since it was a 5min walk from Ornos beach. The staff would pick us up if they saw us waiting for the bus to go into town. Very accomodating and were willing to help and go beyond what was requested.Good holiday and experience. The hosts were extremely warm and friendly offering as much as service as they could. We were flattered by their yoghurt and the family themselves live there. So there was no issue about anything. Everytime we asked them for something and they were at their toes. This place is close to the party destination, Paradise beach, Little Venice, Mykonos Town. This place is just 7 mins from the new port. The best part is the price is very affordable. I am in love with this place and definitely recommendable. 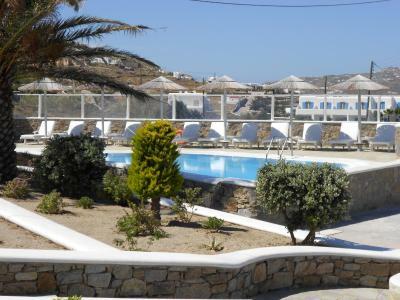 A single night in Mykonos at this entirely acceptable hotel, with a pleasing view of the surrounding area. Of note is that from the pool deck you can see both the west and the east beaches of the island which is pleasing. 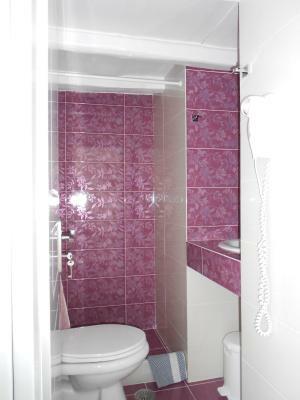 The hotel itself has been recently renovated and is adequately provided with facilities. If you're stopping over in Mykonos on your way to somewhere else (as we were) you could do a lot worse - go ahead! Not even sure how to describe about this place, clearly one of the best stay i have ever had. 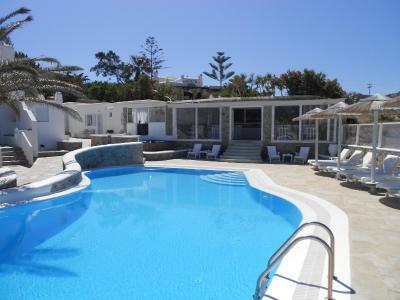 Extremely beautiful place, near Ornos Beach, super cosy and clean pool, cute romantic Villas. Ellia and her family were so nice, sweet and kind. Really nice home made breakfast. Property is managed amazingly by the family. Full 10 points to that. 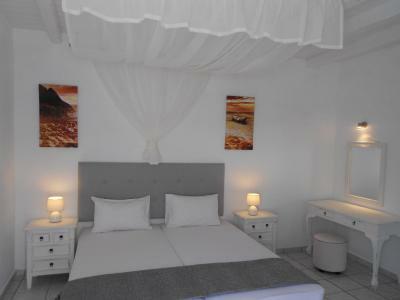 Will definitely stay at the same placec when i am in Mykonos. Transfers to airport were included. Everything was great especially the friendliness of the family. Our stay was very comfortable and enjoyable. The location was great, the staff were very friendly and helpful and the room was very spacious and clean. The free transfer from the airport was a good way to start our holiday. This was our second visit and we hope to return.